Feeling a bit run down today and too lazy to cook anything labourous. I got some chicken and sweet pepper to use up. Don't fancy chicken & pepper in black bean sauce. Finally decided on my old time student favourite, i.e. sweet corn stir fry. 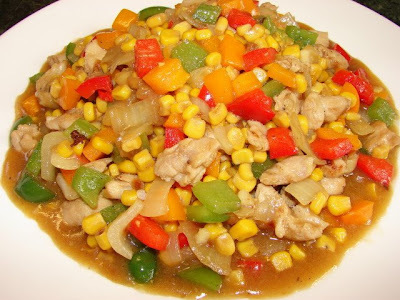 Sweet corn is not something common for stir fry but this recipe is quite nice with rice. Dice chicken then marinate with a little light soy, 1 tsp of cornflour, pinch of pepper, dash of cooking wine and a little sesame oil/shallot oil. Leave aside for about 15 minutes. Dice sweet pepper and onion. Chopped garlic and chilli. Heat the wok with about 3 tbsp of cooking till red hot, add chicken and stir fry for about 1 minutes. Take it out. Without washing the wok fry the onion, garlic and chilli, add a little oil if necessary. When fragrant, add pepper and sweet corn, stir fry for a while then return the chicken to the wok, stir till piping hot. Mix 1 heap tsp of cornflour with 3/4 cup of water. Add this to the stir fry. Then add 2 - 3 tbsp of oyster sauce, pinch of pepper and pinch of salt to taste. Wait till the sauce is thickened and hot. Add a dash of sesame oil or shallot oil.